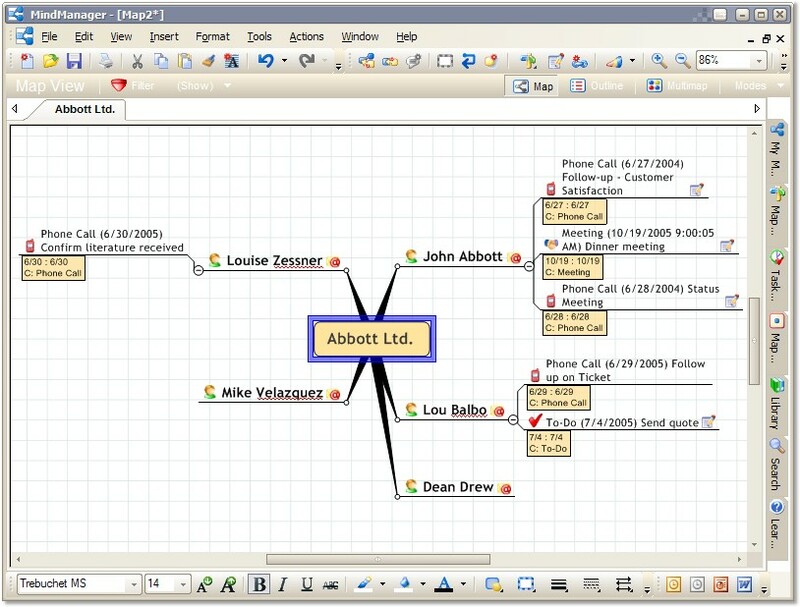 Description: MindManager software allows you to quickly organize data for several uses. Whether to simply display organized data from SalesLogix, or to output action items for an account/contact in SalesLogix to a MindManager document, the possibilities open the door for some quick integration with a great program. 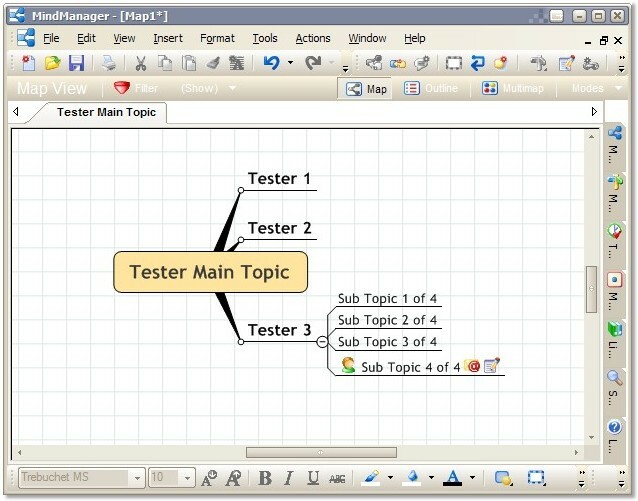 MindManager software from MindJet build maps from a central topic with branches to related subjects, issues, tasks, and deliverables; include resources such as live links and documents. It creates organized documents to make brainstorming, design sessions, etc easier and more effective. If you need to do any planning, brain storming, designing, or organizing ideas, MindManager is a great tool to use. I was only recently turned on to MindManager and have made it a permanent part of my routines when brainstorming new ideas, taking notes and action lists from meetings and so forth. I instantly fell in love with this application, from the perspectives of both a user and a developer. MsgBox "MindManager is not installed. ", 48, "Error"
.Text = "Tester Main Topic"
t.AddSubTopic "Sub Topic 1 of 4"
t.AddSubTopic "Sub Topic 2 of 4"
t.AddSubTopic "Sub Topic 3 of 4"
t.Notes.Text = "This is a test to see some notes"
Displaying account hierarchies. A parent account would be represented by the central topic which would branch out to child-accounts. Tickets branching also to associated activities for each ticket. Contacts branching out to activities for each contact. Opportunities branching out to any activities for the opportunity. Importing tasks from a MindManager map to SalesLogix. Exporting any custom data, such as projects, campaigns, events, etc to MindManager. For this article, we will look at simply displaying a map overview of the current account in SalesLogix to keep things simple. To keep things organized with our code sample, we will construct a VBScript class that can be reused where ever necessary in SalesLogix. This example will export an account overview map from SalesLogix to provide a quick overview of all activities scheduled with contacts from the current account. MsgBox "MindManager is not installed on your computer. ", 48, "MindManager Not Installed"
Err.Raise 1000, "AccountID property has not been set." acttype = .Fields("type").Value & ""
topic.Notes.Text = .Fields("notes").Value & ""
GetScalarValue = .Fields(0).Value & ""
Case "262153" text = "Document"
Case "262154" text = "E-Mail"
Case "262155" text = "Fax"
Case "262163" text = "Literature Request"
Case "262145" text = "Meeting"
Case "262148" text = "Note"
Case "262162" text = "Personal Activity"
Case "262146" text = "Phone Call"
Case "262160" text = "Process"
Case "262147" text = "To-Do"
Case Else text = ""
We certainly could go on and on with this idea, adding tickets, opportunities, etc - to the point where we would have a complete overview all in a single map. Integrating other applications with SalesLogix makes SalesLogix an even more powerful and useful tool. MindManager can enhance the user's experience with SalesLogix like no other application can. GREAT Piece of work Ryan! Oh my god. You did it all in Architect LOL. Great article. I'm checking this product out. Great Job! I've actually been thinking of doing something like this for a while. You snooze you lose I guess. How difficult do you think it would be to do the same kind of thing with FreeMind (freemind.sourceforge.net)? The file structure is very simple, I know it wouldn't be too hard. And even though it isn't quite as pretty, you can't beat the price! I've just implemented this and it works a treat - good work Ryan! Did you ever get round to coding Account Hierarchies? Would be a very nice way of displaying them.